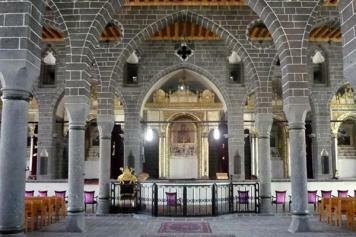 The Turkish government has decided to expropriate 6,300 structures and plots of land in the Sur district of Diyarbakir (one of the largest cities in southeastern Turkey), which includes St. Giragos Armenian church, one of the largest churches in the Middle East that belongs to the Armenian community. The decision caused concerns and anxiety among Armenians living in different parts of the world. In 2011, through their donations, St. Giragos was reopened and consecrated. Foreign Minister Edward Nalbandian has called for greater international assistance to thousands of Syrian-Armenians who have taken refuge in Armenia since the start of the conflict in Syria in 2011. Relations between Armenia and Georgia are being discussed in Yerevan today during meetings of visiting Georgian Foreign Minister Mikheil Janelidze with Armenian officials, including President Serzh Sargsyan. An ethnic Armenian was injured in Turkey in a weekend suicide bombing attack in central Istanbul. Oksan Khachanian, 40, was at his workplace when the bomb blast occurred in the city’s shopping area, editor-in-chief of the Istanbul based Armenian Jamanak daily Ara Kochunian said, reports the Public Radio of Armenia. Some experts in Armenia consider that Russian President Vladimir Putin’s unexpected ordered to withdraw the bulk of the country’s troops from Syria may mean that Moscow will be focused more on Ukraine and the Caucasus region where Armenia hosts a Russian base. With a vote of 393 to 0, the U.S. House of Representatives unanimously condemned as genocide the ongoing ISIL/Da’esh crimes against Christians – including Armenians and Assyrians – as well as Yezidis and other religious minorities in the Middle East by adopting H.Con.Res.75, reports the Armenian National Committee of America (ANCA). As two ancient civilizations, Armenians and Greeks have long been creating and struggling next to each other, leaving their trace in world history, President Serzh Sargsyan emphasized on his official visit to the Hellenic Republic on Monday. While Europe is grappling with one of its most serious recent migrant crises caused by the influx of refugees and asylum seekers from war-torn Syria, the South Caucasus nation of Armenia says it is also making a contribution to dealing with the situation. All the communities of Syria, including the Christians, must take part in that country’s peace process, according to a top Armenian cleric. Official Yerevan welcomes the U.S.-Russian agreement on ceasefire in Syria, the Armenian Ministry of Foreign Affairs has said in a statement on its official Facebook account.